Whispering Whale is situated on the West Coast of South Africa in Jacobsbaai, offering one of the most beautiful and self–fulfilling natural landscapes in Africa.This quiet Village, also referred to as the “Namaqualand” of the West Coast, with its traditional lime washed houses, is set against a breathtaking coastline with rocky out crops and sandy bays with a cobalt ocean. 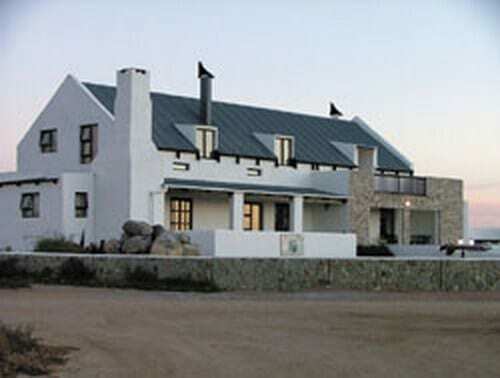 Jacobsbaai is ideally situated for excursions throughout the Cape region. 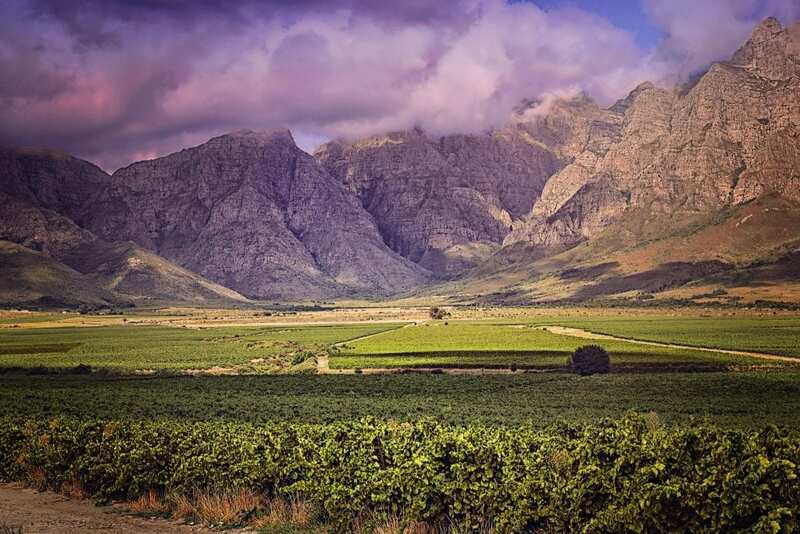 The cosmopolitan city of Cape Town, Cape Town International Airport, the Cape Winelands, the West Coast National Park, the West Coast Flower Region and many other attractions, are all within easy travelling distance from Jacobsbaai. Whispering Whale features luxurious, stylishly furnished units, each with sea views. 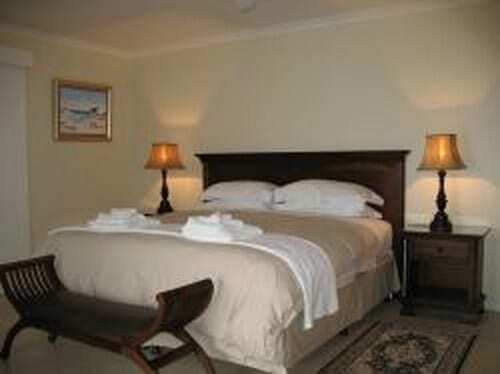 Each unit has a separate lounge, dining room and fully-equipped, modern kitchen with dishwasher. Meals are served on request. 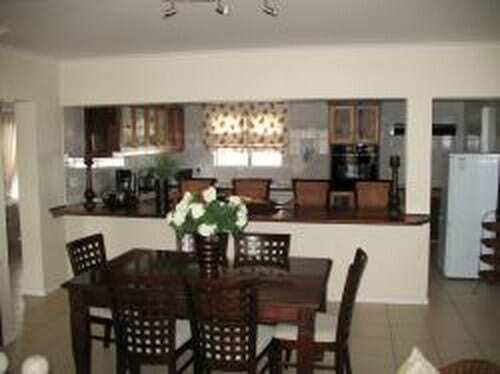 The house has been transformed into 3 stunning apartments with safe and secure parking. The BRYDES WHALE is the 4 sleeper apartment and features 2 luxury bedrooms with king size beds, each with their own en-suite bathroom. The bathrooms have pentagonal showers, modern baths, heated towel rails, double basins/vanities and toilets.This apartment also features a fully equipped modern kitchen with a dishwasher.There is a lounge with TV, DStv, mini HiFi, DVD / Dining area, opening onto a large verandah with patio furniture and an outdoor barbeque. Decorated in natural shades, the apartment exudes a sense of peace and extreme comfort.The bedrooms are tastefully furnished, with down duvets and 100% cotton percale linen. The HUMPBACK WHALE, which is the luxury penthouse (loft) apartment, is ideally suited to a couple seeking more space and comfort and can also be rented by a family of 4 (regrettably only children over the age of 14).This apartment features 2 bedrooms, the master bedroom has a king size bed and the second bedroom has twin beds. There is one en-suite bathroom, with a pentagonal shower, modern bath, heated towel rails, basin/vanity and toilet. 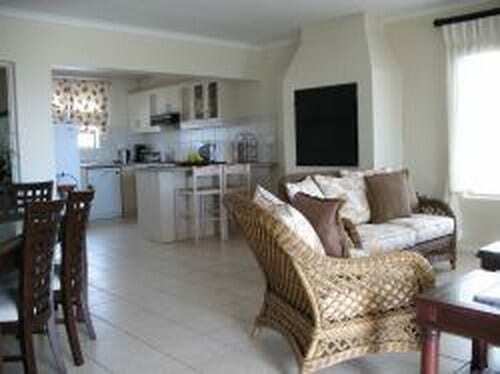 This apartment also features a fully equipped modern kitchen with a dishwasher as well as a lounge with TV, DStv, mini HiFi, DVD and a separate dining room with an indoor barbeque / fire place.The lounge opens onto a sea facing balcony, with patio furniture and an outdoor portable barbeque (Weber). The SOUTHERN RIGHT WHALE is the smaller 2 sleeper apartment. This ground floor apartment has one luxury bedroom with a queen size bed, en-suite bathroom with a pentagonal shower, heated towel rails, basin/vanity and toilet. 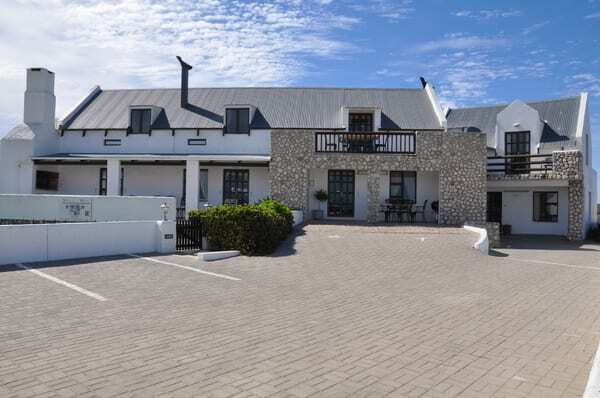 This apartment also features a fully equipped modern kitchen with a dishwasher as well as an open plan lounge with TV, DStv, mini HiFi, DVD / dining room with an indoor barbeque / fire place.The lounge opens onto a sea facing patio, with patio furniture and an outdoor portable barbeque (Weber).